On the other hand, they have more in common than you may realize. For starters, they're both Hondas and they're both Civics. They're both available only with manual transmissions and they're both aimed at drivers who enjoy more interaction, better control, and more feedback than your average family sedan provides. First, let's take a look at the Civic Si. Sometimes criticized for being too similar to the regular model, the 2017 Civic Si no longer has a unique engine and transmission within the Civic lineup as it has in the past. Instead, Honda used essentially the same 1.5L turbocharged engine from other Civics and the CR-V, but with a few tweaks. Considering the base Civic's 2.0L non-turbocharged engine is a significant improvement over the previous Civic's 1.8L engine, the 1.5L turbocharged engine almost seems too good for the regular Civic and might should have been reserved exclusively for the Si. This would have widened the gap between the regular Civic and the Civic Si making the latter more exclusive and perhaps even more desirable. Drivers looking for some of the highest performance numbers from a front-wheel drive vehicle need look no further than the Civic Type R. The 2.0L turbocharged engine produces lots of torque over a wide range. Handling? Sharp. Grip? Tenacious. Steering? Quick. Although Honda priced the Civic Type R well for the overall package, long-term ownership comes at a higher cost. Honda clearly cautions on the window sticker that the factory tires may less less than 10,000 miles. At twice the cost of the Si's all-season tires, maintenance costs can rise quickly. The Civic Si offers about two-thirds of the power produced by the Civic Type R for about two-thirds of the price, but there are other upgrades that make the Type R more compelling and a better value based on MSRP. 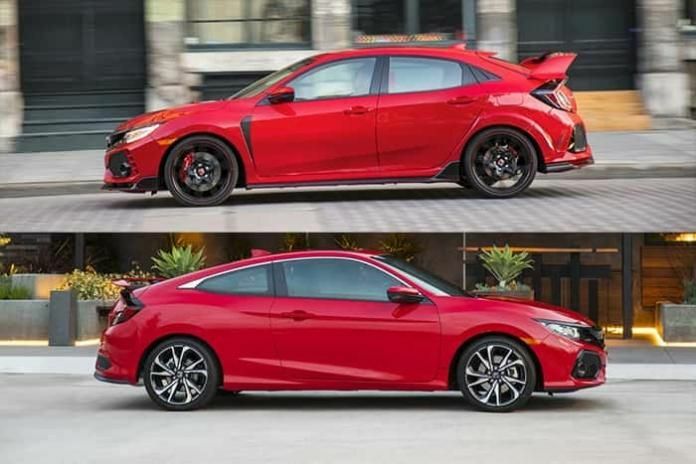 There are far more Civic Si available for purchase than Civic Type R, so the chances of getting an Si in the the color and body style you want at a reasonable price are much greater. See article on Civic Type R pricing at here. The Civic Type R's radical appearance tends to draw attention. Lots of it. And, not always in a good way. Within a few months after the Type R went on sale, photos and stories of wrecked models began appearing. In many of these reported accidents, the Type R was struck from behind. Shoppers looking for a more exciting daily driving experience, but with low maintenance costs should consider the Civic Si. The standard, all-season tires are almost half the cost of the Summer tires that come standard on the Type R. With a wider sidewall between the pavement and the wheel, there is less chance of damaging the Si's wheels due to potholes or other road hazards. There is no question that the Type R offers a better performance value than the Si at Honda's suggested pricing, but the best vehicle for you depends on your expectations and intended use for the car. The Type R has levels of performance that cannot be fully utilized or appreciated when driven in a legal and safe manner on public roadways. It is clearly the better choice for competitive racing, but several buyers who opted for a Type R quickly realized that it can be a bit much when used a daily driver. It's not that the Type R isn't comfortable or capable of daily driving. In fact, it is surprisingly livable as a daily driver, but might not be the most cost-effective choice. For shoppers looking for something more exciting than your average vehicle in a package that can be purchased and maintained more economically, the Si is an excellent choice. For more serious competition, the Type R's higher purchase and ownership cost is easier to justify. I’ve owned several Si in the past. The 2016+ model, I went with a Touring. Why? Because it’s still got plenty of punch and a lot of luxury features for the same as I’d have paid for an Si (I got a good deal). Maybe I’m just getting older, but the fact that the Si has halogen lamps, no leather option, and no navigation is a complete deal breaker for me. The Type R is another story. I just can’t justify paying that much for a Civic. Ya Honda Canada did well to add the LED headlights and Navi. The seat material does leave a lot to be desired. Not sure if I’d want leather instead but they could’ve done better. Sean, Canada seems to get all the good stuff! The Canadian Ridgeline, example, offers several features that the US models don't such ventilated seats. I still can't quite figure out why a cooler climate area gets them and a warmer climate area does not. I think Honda got that one backwards! Mike, you're right - the Civic's Touring trim offers a lot of car for the price and its availability makes it easier to get bigger discounts compared to some of the more obscure trims like the Si, Type R, and others equipped with manual transmissions. I was surprised that Honda dropped navigation as an option for the US Si for 2017. Good comparison of Honda Civic Si vs Honda Civic Type R. Thank you Roger.